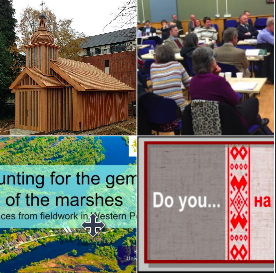 The conference will feature scholars of Belarusian studies from the United Kingdom, Belarus, Germany, Sweden, Finland, Canada and other countries. It will have sections on history, national identity, foreign policy as well as presentations on other themes. This year the Annual Lecture on Belarusian Studies will be delivered by Alena Marková from Charles University in Prague. The conference will start at 9 am on Friday, 23 March 2018 at the University College London (UCL). The preliminary conference programme, registration and more details are available here. The Symposium to mark the 100th anniversary of the Belarusian Democratic Republic will gather academic speakers from Belarus, Poland and Lithuania to discuss for a UK audience the significance of the 1918 Belarusian Democratic Republic in Belarusian and regional history. The Symposium will begin at 11 am on Saturday, 24 March at UCL SSEES. More details available here. This year after the festive Divine Liturgy, on the occasion of the 100th Anniversary of the Belarusian Democratic Republic, proclaimed in Miensk in 1918 Association of the Belarusians in Great Britain shall hold a reception at St. Cyril’s Centre, Marian House for those present at the service. The participants will also be offered a tour of the Belarusian Skaryna Library with an exhibition of items related to the Belarusian Democratic Republic. Are all welcome. This programme will start at 10 am on Sunday, 25 March at the Belarusian Religious and Cultural Centre (Marian House, Holden Avenue, London N12 8HS). For more details, please visit belaruschurch.org.uk or contact Fr Serge Stasievich <ks.mgr.stasievich@gmail.com>. This entry was posted in ABS and tagged Belarus, belarusian language, conference, london. Bookmark the permalink.